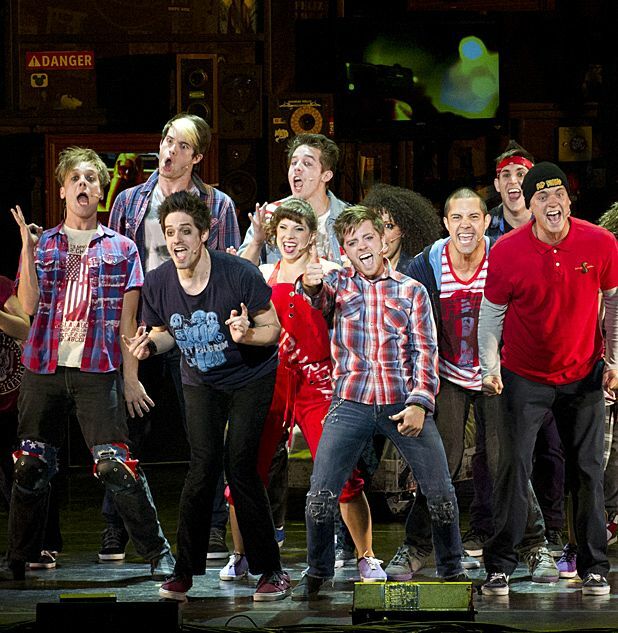 American Idiot is a bit of a hard sell: too clean cut for punk fans, too scuzzy for lovers of musicals. Which is a shame as it brings a freshness to the form that is a world away from other jukebox musicals such as Mamma Mia! and We Will Rock You. It’s also helped by the fact that Green Day’s concept album has a rough narrative, recurring characters and very definite themes running though it, giving the story some structure even before this adaptation was conceived (the band themselves were involved in the Broadway production, with lead singer Billie Joe Armstrong even taking on the role of St Jimmy for a number of performances). The opening blast of the title track sets the scene: a pounding punk rock explosion broiling over with energy, a live six-piece band right in the centre of the action, thus capturing the feel of a live gig more succinctly than any other musical. The story itself follows three friends drifting through life. They have no goals and no purpose. Tunny (Thomas Hettrick) ends up enlisting in the army and is shipped to Iraq; Will (Casey O’Farrell) feels trapped by his pregnant girlfriend and spends his time slumped on the sofa drinking beer and smoking bongs while Johnny (Alex Nee), aka the Jesus of Suburbia, drifts into hard drugs under the influence of charismatic dealer St Jimmy (Trent Saunders). It’s a story of aimless malaise, the breakdown of bonds in society and the seduction of the innocent told via a barrage of strobes, middle fingers and bratty dance numbers. The set is covered with TV screens spewing out information and slogans. Unfortunately the stylish production sometimes sacrifices clarity of storytelling for dynamism and all the female characters are thinly sketched ciphers, as can be seen from their names: Whatsername, Alyssa Dipalma, and The Extraordinary Girl, Jenna Rubaii. With roots in the rock musical likes of Rent, Hair and Tommy, perhaps American Idiot isn’t as subversive as it would like to be. There is a shiny musical polish at work here that tones down Green Day’s punk power but the music still retains an anti-authoritarian stance, performances of the songs ‘American Idiot’, ‘Wake Me Up When September Ends’, ‘21 Guns’, ‘Holiday’ and ‘Good Riddance (Time of Your Life)’ being real stand outs. Despite its drawbacks it's still a bold, flashy punk opera for the 21st century. - Playhouse, Edinburgh, until Sat 27 Oct; SECC, Glasgow, Mon 29 Oct-Sat 3 Nov. The Green Day musical featuring songs from the Grammy award-winning album of the same name and a story of three young people from the suburbs searching for meaning in a post 9/11 world. Veteran pop punk rockers, all-conquering since the release of their 'American Idiot' album.